One of the most expensive parts of the holidays is traveling. Whether you want to see your relatives or have fun on a relaxing vacation, the prices of airfare and gas seem to skyrocket during this time. The Holiday Travel Budget Calendar is here to help you keep your expenses to a minimum. This template has all the necessary tools to help you create a customized budget and include everything you need to spend to get to your ideal travel destination. 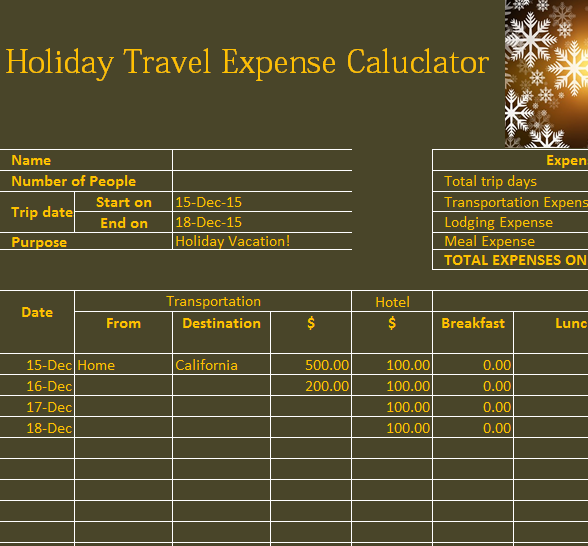 By monitoring your travel expenses, this template will also put you into the right mindset to save money on every turn this holiday season. Nothing is better than spending the holidays with your loved ones; make it even better by saving time and money this year! To download the free file, simply click the link located at the bottom of this page. Doing this will automatically download the file to your computer. Now you can begin customizing the document to suit your every need! In the top-left table of the page, enter your name, the number of people joining you, the start and end date of your trip, and finally the purpose of your travel. Scroll down to the main table at the center of the page. The “date” column is where you will enter the specific dates of each day of your trip. After the dates, the template conveniently breaks down each aspect of your travel into three different sections (Transportation, Hotel, and Meals). Go through each of these sections and enter the amount you spent for each corresponding day. The calculator in the top right corner of the page will take all of these numbers and give you a comprehensive total amount spent for the essentials of your trip! It’s that simple! By using the Travel Budget, you will have a comprehensive and accurate way to assess the expenses of your holiday travel plans. Furthermore, you can create a budget that will give you the freedom to truly enjoy your holiday trip, without the added worry of financial distress that happen to most people during their holiday travels. Make the most of this time with your friends and family, download this free template today! Make your own custom travel budget for the holiday season!